Sayonara is a free lightweight music player for Linux systems. It supports many music and playlist formats and external device support. Its web based features are Last.FM scrobbling, Soundcloud and Soma.fm support, Internet streams, Stream recorder, Podcasts and Radio Broadcasting. You can search in media library and organized your media in directory view, Genre and Playlist view. Some other features of sayonara are Equalizer and Crossfader support, Metadata editor and Customizable spectrum analyzer and level meter. you can use it as a MP3 Converter and control the speed and pitch.It is written in C++ and uses Qt framework.It is released under GPLv3 licence. Installation process is simple, just add its PPA on your ubuntu system and install. To add it open your terminal app in ubuntu and type the below code and hit enter. Type your ubuntu password and press the enter. Then again press the enter key to confirm the addition. the run the below command in terminal and hit the enter. 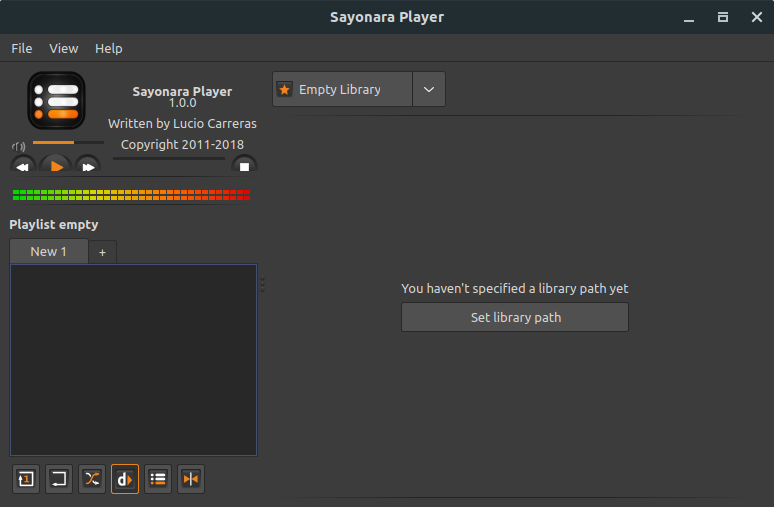 Then run the below command to install the Sayonara Music Player on Ubuntu. After the installation of Sayonara Music Player, click the show applications in the Ubuntu Gnome dock and type Sayonarain the search box and click Sayonara to open it. For Unity you can search Sayonara from ubuntu dash.